Aizawl, Nov 8 : One development plan that seems to be moving backwards in poll-bound Mizoram is hydro power. "We have said many times we are going to dam all our rivers," Chief Minister Lal Thanhawla had said when this journalist asked AICC general secretary Luizinho Faleiro in September how the party intends to boost the state's debt-ridden economy if it wins again. The state Congress president had indeed said at several public meetings earlier that dams would be built across the more than a dozen rivers that run through the hill state's ravines so that they can generate 2500 MW. As things stand now, plans are afoot and some work has begun on building dams across five rivers that can generate close to 1,000 MW for a state that requires barely 100 MW but where about 90 per cent of the demand is imported. Among the proposed schemes is the 210-MW Tuivai project, approved earlier this year by the Centre and set to be the first hydro power project in India to be built through viability-gap funding and on a public-private partenrship. But Lal Thanhawla's government appears to have climbed down from its damming plans after anti-dam sentiment began surfacing, most of it fuelled by fears generated by the inundation of Builum village in northern Mizoram by the Serlui hydro power project, which anyway has been able to produce just a fraction of the 12 MW it was expected to. The first opposition to a policy of damming all Mizoram's rivers came from the Science Teachers' Association of Mizoram, which cautioned against going head-on without first calculating the risks. The rebel group-turned-political party Hmar People's Convention said shortly after that it would oppose the Tuivai project at any cost since it would inundate several villages in the area. Later, the powerful Young Mizo Association, the largest mass-based voluntary organisation in Mizoram, spoke out against the planned Tipaimukh dam on the Manipur-Mizoram border and questioned the wisdom behind dams in general given the amount of land it feared these will submerge. In recent speeches, Lal Thanhawla has been more careful about talking about dams, and has said repeatedly, "We will work towards quickly finding and exploiting natural gas reserves which some companies have already begun so that we would not have to dam all our rivers." Interestingly, the Congress manifesto for the November 25 polls does not even mention dams, and only states that the party will "try to produce at least 280 MW and try to have electricity in all rural areas within 5 years." In another section the manifesto states the party "will continue to explore natural resources to earn more state revenue, produce electricity and cooking gas." 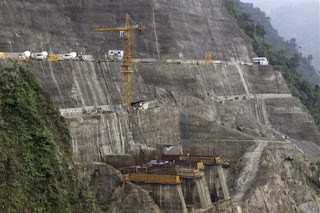 The Mizoram Democratic Alliance led by the Mizo National Front with the Mizoram People's Conference and Maraland Democratic Front has been more blatant about completing the planned hydro power projects, promising in a joint manifesto that four planned dams with a combined capacity of almost 1,100 MW "will be completed as early as possible". However, it adds, "In view of the environmental impact that hydroelectric power projects and dams have, proposals for harnessing hydroelectric power will be reviewed taking into account the comprehensive survey and study of land that will be inundated and displacement of population."